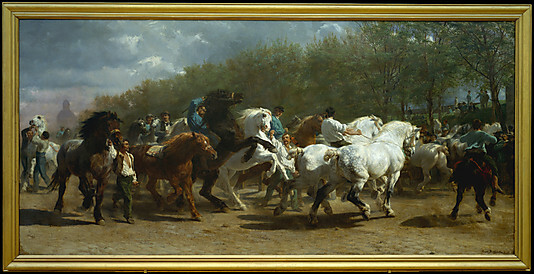 ahh yes the Rosa Bonheur. On a few occasions, it was assigned to me to guard. It is a huge painting that takes up a whole wall. Many celebrities have had their picture taken next to it. My celebrity that I had to yell at?? Crispin Glover. He used a flash. He insisted he have his picture taken arms outstretched in the middle of the piece. Yes is was a chuckle moment. But the most memorable time I had with this painting, was with a group of 8 foreigners. One of them decided to plop/slap the derriere of the horse in the middle. I yelled– should have blown my whistle in retrospect– “NO!” Needless to say there was a language barrier– or a stupidity barrier. He looked at me I was coming forward toward him. What did he do? Inch forward. Inch by inch arm still outstretched over the painting. Needless to say after I called it in, every supervisor was in that gallery inspecting it. they even came up to me to talk about it. What did they do????????? That’s a question I’ll leave up to you to answer. But me? I nearly had a heart attack. The other guards heard about it and were soooo angry with the people. I told you its like the work becomes your children. Guards not even in my section knew about it! So anyway, here is the painting. Rosa painted herself in the middle with the hat on. She used to dress like a man to go to the horse sales.